Independent research has shown that the individual plant-derived ingredients contained within this unique blend may help with the alleviation of back, neck & joint pain by targeting multiple biological pathways involved in inflammation. What is the dosage for RheumaLin? Take 2 tablets 2 – 3 times a day with a meal. 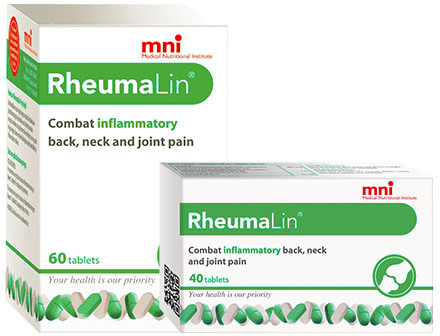 RheumaLin contains a blend of plant-derived (phytochemical) ingredients recognised for their ability to help alleviate inflammation, reduce pain and improve joint mobility. Its multi-modal pharmaceutical action is achieved through the selective blocking of key inflammatory enzymes that play a dominant role in the activation and maintenance of inflammation, pain and joint destruction. The ingredients contained within RheumaLin are Indian frankincense and resveratrol. Indian Frankincense is a bark resin extract that has been used for centuries in traditional Ayurvedic, Chinese and Middle Eastern medicine as an anti-inflammatory and pain-relieving remedy. Resveratrol is a natural chemical made by various plants as a defence mechanism in response to microbial and fungal infections. It occurs naturally in low amounts in several edible plants and plant-based products such as grapes, cranberries, peanuts and wine, especially red wine. Anyone suffering from joint pain, back or muscle pain. Can be used during acute injuries as well as in chronic arthritic conditions. Who should not take RheumaLin? If you are hypersensitive or allergic to any of the ingredients contained within RheumaLin. If you have advanced liver disease. The individual ingredients contained within RheumaLin are generally considered to have a low side effect profile. Arthritis Research UK, a British arthritis research organisation, for example, has given Indian Frankincense a rating of 4 out of 5 for efficacy and a green safety rating. (The safest category). Diarrhoea, abdominal pain and nausea may occur. Does RheumaLin have the same effect on your stomach as anti-inflammatory medication (NSAIDs)? Can RheumaLin be taken in combination with prescription pain killing medication? Yes, RheumaLin can be used in combination with both steroidal (cortisone) and non-steroidal anti-inflammatory drugs (NSAID’s), as well as with all pain killing medication (analgesics). Trials conducted on Indian Frankincense have demonstrated that in many instances, subjects suffering from joint pain were able to reduce their prescription medication requirement significantly, thereby reducing the potential of long-term side effects commonly caused by NSAIDs and steroids. How does RheumaLin’s mode of action differ from anti-inflammatory drugs and steroids? Whilst the anti-inflammatory effects of the steroidal and non-steroidal anti-inflammatory drugs (NSAIDs) are pharmacologically ascribed to the broad-based blocking of key inflammatory mediators at a high level in the inflammatory cascade, boswellic acids, contained within RheumaLin, exert an anti-inflammatory effect on a more selective basis at a much lower level. It has been suggested that this mechanism of action explains its lower side effect profile when compared to steroids and NSAIDs. RheumaLin contains a blend of two phytochemical (plant-derived) compounds. These are a gum resin extract obtained from the Indian frankincense tree (Boswellia serrata), presented in a proprietary formulation as Lin-beta, and resveratrol, a phenolic compound found in various plant species such as grapes, cranberries and peanuts. Extracts from frankincense resin have been used in traditional Ayurvedic, Chinese and Middle Eastern medicine as an anti-inflammatory and pain-relieving agent for centuries. Accumulating evidence in scientific literature from both animal and human studies supports the use of frankincense resin for a variety of inflammatory disorders. These include several randomised, double-blind, placebo-controlled studies on human subjects suffering from osteoarthritis of the knee, which demonstrated that frankincense resin helps to reduce pain and swelling whilst improving joint mobility. Kimmatkar K (2003) Sengupta K (2007) Sontakke S (2007). The effects of frankincense resin are biochemically attributed to a group of chemical compounds called boswellic acids, all pentacyclic triterpenes which occur in both an α- and β-configuration. Various pharmacological studies indicate that β-configured boswellic acids exert stronger bioactivities as compared to the respective α-isomers. Whilst the anti-inflammatory effects of the steroidal and non-steroidal anti-inflammatory drugs are pharmacologically ascribed to the broad-based blocking of key inflammatory mediators at a high level in the inflammatory cascade, boswellic acids appear to exert an anti-inflammatory effect on a more selective basis at a lower level. Recent research suggests that the principle mode of action of frankincense resin is due to the ability of certain boswellic acids to inhibit two cardinal enzymes responsible for inflammation, pain and connective tissue degradation. These are cathepsin G (CatG) and prostaglandin E Syntase-1 (PGES)-1. Abdel-TawabM (2011). The integrity of connective tissues such as cartilage, intervertebral discs, tendons and bones plays an integral part in a highly dynamic process that requires resisting as well as recovering from the continual friction and mechanical strain caused by movement and load bearing. Cathepsin G (CatG) is a proteolytic (protein cleaving) enzyme responsible for the breakdown of proteins through proteolysis into smaller particles such as amino acids and polypeptides. Whilst the process of proteolysis serves many beneficial purposes such as the removal of abnormal proteins and preventing the accumulation of unwanted proteins within tissue, the unregulated cleavage of protein-based structures also causes physical damage to cartilage, intervertebral discs, tendons and bones, thus playing a cardinal role in the development of degenerative disease. CatG is predominantly contained within neutrophils (specialised white blood cells). Once released into the plasma, CatG cleaves numerous structural connective tissue proteins such as laminin, proteoglycan, collagen, fibronectin and elastin. In doing so, CatG plays a dominant role in both the repair and destruction of connective tissue at sites of injury or inflammation. It has been shown that CatG also activates various chemokines (chemical messenger molecules) that attract other inflammatory cells such as T cells and leukocytes, which also release proteolytic enzymes. Collectively, this action accelerates the rate of damage caused by the inflammatory process. Research has demonstrated that boswellic acids are powerful inhibitors of CatG. In rigid, automated, molecular docking experiments, boswellic acids tightly bound to the active centre of CatG derived from human neutrophils and strongly suppressed the proteolytic activity of CatG as a result, thus displaying the potential to help alleviate inflammatory pain and preserve joint health by helping to prevent the enzymatic degradation of cartilage and surrounding soft tissues. Tauch L (2009). Prostaglandin E synthase-1 (mPGES-1) is an enzymatic catalyst that acts as a dominant inflammatory mediator in the prostaglandin pathway, an essential component of the inflammatory cascade. Activation of mPGES-1 leads to the subsequent production of Prostaglandin E which leads to fever, swelling and pain, a process that assists with the healing of injured tissues and resisting infection. In contrast, however, excess levels of mPGES-1 are also implicated in the activation and maintenance of a number of pathological inflammatory conditions that include rheumatoid and osteoarthritis. As a consequence, mPGES-1 is now regarded as a primary target for the development of novel anti-inflammatory drugs. Research has demonstrated that boswellic acids are potent inhibitors of human mPGES1. In particular, β-configured boswellic acid was found to be highly effective both in vitro and in vivo and suppressed the transformation of prostaglandin H2 (PGH2) to prostaglandin E2 (PGE2), as mediated by mPGES1, in cells as well as human whole blood. Siemoneit U (2010). Resveratrolis a phytoalexan stilbene made by various plant species as a defence mechanism in response to microbial and fungal infections. It occurs naturally in low amounts in several edible plants and plant-based products such as grapes, cranberries, peanuts and wine, especially red wine. In contrast to frankincense resin, resveratrol’s entry into the scientific world is relatively new and data from animal and experimental studies in relation to the alleviation of certain inflammatory conditions appears promising. At cellular level, osteoarthritis is characterised by an imbalance between the processes that lead to the anabolism (building up) and catabolism (breaking down) of cartilage. Disruption of the internal regulatory environment within cartilage cells results in metabolic changes, loss of adhesion properties, elevation of protein cleaving enzymes and degradation of the structural matrix components of cartilage such as collagen and proteoglycan. The biological activity of these potentially damaging pathways is to a large degree regulated by nuclear factor-kB (NFkB), which may be activated in response to injury, endotoxins or inflammatory mediators. After activation, NF-kB prompts the expression of more than 400 genes, some of which are intimately involved in the process of regulating cartilage apoptosis (cell death) and activating inflammation. Dysregulation of NF-κB has medically been associated with various inflammatory and autoimmune diseases including cartilage degradation and joint destruction. In recent years, novel and modern therapeutic strategies have therefore focused on the selective inhibition of the NF-kB signalling pathway. Experimental research has examined the effects of resveratrol on human cartilage and human articular chondrocytes (cartilage cells). Research specimens used in this study were derived from articular cartilage explants obtained from healthy femoral head cartilage acquired during routine joint replacement surgery for femoral neck fractures. In this study, resveratrol demonstrated convincing anti-apoptotic (preventing cell death), anti-oxidative (neutralising free radical damage) and anti-inflammatory effects.These observations were directly linked to the ability of resveratrol to inhibit the signalling pathway of nuclear factor-kB (NFkB). Shakibaei M (2008).